With trailers being designed to carry heavy loads, tyres are a very important part. There are several different types tyres including Bias ply, Crossply and Radial tyres. These tyres can all have different ply ratings, so it can be difficult getting the correct tyre for your trailer. Most tyres have their maximum weights in small writing on the tyre wall, but this is not always the case. All Road tyres have a load index. 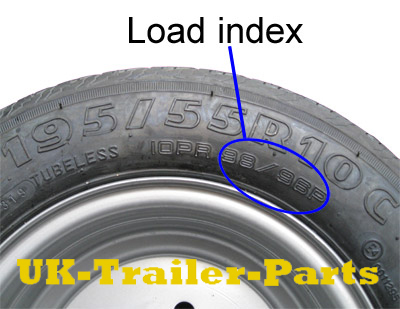 This is a number usually between 60 and 106 for a trailer wheel, followed by a letter. The letter is the speed symbol, this is normally marked on the tyre next to the tyre size. See the image below. The tyre shown above has two numbers written on it. The first number is for a single axle trailer, and the second number is for a multi axle trailer. Figures marked on this image are 98/96. 98 represents 750kg and 96 represents 710kg. This weight is per wheel. Please see the list below for a full list of Load index conversions.